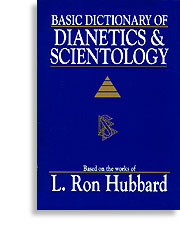 In studying Dianetics and Scientology, be very certain you never go past a word you do not fully understand. The only reason a person gives up a study or becomes confused or unable to learn is because he or she has gone past a word that was not understood. The confusion of inability to grasp or learn comes AFTER a word that the person did not have defined and understood. Have you ever had the experience of coming to the end of a page and realizing you didnt know what you had read? Well somewhere earlier on that page you went past a word that you had no definition for or an incorrect definition for. It may not only be the new and unusual words that you will have to lookup. Some commonly used words can often be misdefined and so cause confusion. This datum about not going past an undefined word is the most important fact in the whole subject of study. Every subject you have taken up and abandoned had its words which you failed to get defined.